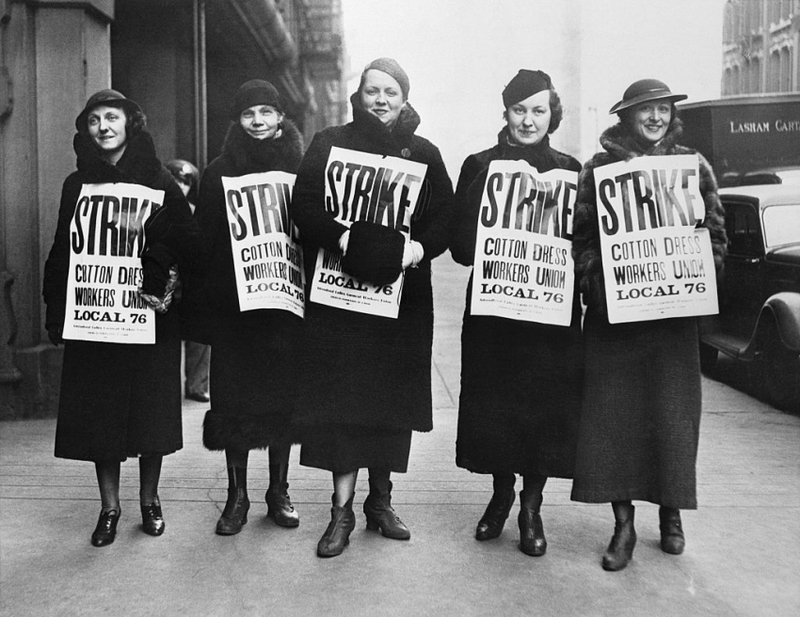 The claim that strikes are reflections of privilege is totally disconnected from the history of women’s labor organizing in the US. As Wednesday’s Women’s Strike continues to makes headlines, there’s a strange idea floating around the Internet: that striking is for the privileged, the province of well-off women with the luxury of being able to claim a vacation day or hire other people to take care of their children and loved ones. In a country with a union density just south of 11 percent, there are a number of legitimate questions to be raised about the feasibility of a strike in 2017. Workers’ bargaining power stands at historic lows, and the institutions that once supported striking workers (namely, unions) have been eroded by a mix of neoliberal assault and market forces. Women, in particular — inordinately represented in low-wage service work — enjoy perilously few protections on the job, and are all too likely to face retaliation from their bosses for not showing up. Thanks to these and other structural factors, what happened yesterday was not a truly mass strike. That’s why organizers outlined a number of ways to plug into the day’s events, inside and outside the workplace. Still, what’s troubling about an analysis that claims striking-as-privilege is its near-total disconnection from American labor history. Women’s strikes have never been about “abdicat[ing] parenting responsibilities in solidarity,” as Quartz’s Maureen Shaw put it — performing the role of a dutiful, privileged ally — but about recognizing a shared struggle across a workplace, industry, class, or (in this case) country. Meghan Daum, at the Los Angeles Times, made an argument similar to Shaw’s but still more ill-informed: that women striking would somehow show that they are an accessory to the economy, instead of critical to its functioning. In discussing the historical precedents for Wednesday’s strike, several writers have pointed to recent actions abroad — like those in Iceland and Poland — and a 1970 women’s strike for equality in the workplace, organized by America’s National Organization for Women. American history, however, is rife with examples of women striking as workers, at considerable risk to their lives and livelihoods. Following mining and the building trades, for instance, the textile industry — staffed almost entirely by women — was the third most strike-prone industry in the country in the early 20th century. Here are just a few examples of women who walked off the job. Less than twenty years after the end of the Civil War, half of Atlanta’s black wage earners were women, almost all doing domestic work for white households. Of those, many women were employed as laundresses, or “washerwomen,” to whom wealthy, middle class and even poor whites would send their dirty clothes. Washerwomen, including many former slaves, made between $4 to $8 a month for long hours of physically demanding labor. In the summer of 1881, twenty washerwomen met and formed the Washing Society, comprised entirely of African American women. Canvassing fellow workers and garnering support from the city’s black churches, the Society’s ranks swelled from 20 to 3,000 laundresses in just three weeks. Strike meetings were held every night, and strikers faced arrests and harassment from police. Amid complaints from white families, the city charged women participating in the strike with “disorderly conduct and quarreling,” according to the Atlanta Constitution, and fined them sums greater than many of their monthly wages. Eventually, the Society settled with the Atlanta City Council to pay a $25 annual licensing fee in exchange for higher rates and more autonomy. “We can afford to pay these licenses, and will do it before we will be defeated, and then we will have full control of the city’s washing at our own prices,” the women wrote in a statement to Mayor Jim English. The strike had a chilling effect on Atlanta’s white business and political establishment, unsure of whether the city could run without black labor. Shortly after the Washerwomen’s strike, Atlanta’s government caved to demands from cooks, maids, hotel workers and nurses for higher pay. It all started with a spat of spontaneous strikes in the Leiserson Company, the Rosen Brothers and at Triangle, protesting workplace safety issues, low wages and rampant sexual harassment, among other issues. In conditions common throughout the industry, Triangle workers worked uninterrupted 14 hour shifts with just one bathroom break, forcing many to urinate on the factory floor. Work actions, begun in the late summer and fall, carried on for several months before Local 25 of the International Ladies Garment Workers’ Union (ILGWU) began to question whether members should return to work. At a packed meeting to discuss the strike’s future, worker-organizer and Local 25 executive committee member Clara Lemlich made an impassioned call: “I am a working girl, one of those who are on strike against intolerable conditions. I am tired of listening to speakers who talk in general terms. What we are here to decide is whether we shall or shall not strike. I offer a resolution that a general strike be declared — now.” The resolution passed. In the morning, 15,000 shirtwaist workers struck. Overall, 70 percent of strikers were women. Ninety percent were Jewish. More than 700 were arrested within just one month, nineteen of whom were sentenced to the workhouse. Several faced beatings by police. As in other strikes, several of the most instrumental organizers were socialist women and immigrants, like Lemlich and Rose Schneiderman. Eventually, strikers’ resources were exhausted and the uprising was called off — though not before winning significant concessions. The strike was also a boon for the ILGWU, which, by the end of the strike, counted some 85 percent of New York shirtwaist makers as members. Inspired by the events of 1909, similar strike actions followed, eventually rendering the textile industry one of the country’s most union-dense. Beyond those gains, the uprising further cemented women’s role in the to-that-point fairly conservative ILGWU, the leadership of which would be replaced by socialists in 1914. By 1910, Chicago’s textile industry was its third largest employer, and its largest employer of working women. Beginning in late September with 16 women in the Hart, Schaffner and Marx plant — the largest clothing manufacturer in the nation at the time — the strike swelled to 2,000 workers in just the first week, including Yiddish, Czech, Polish, Italian, Lithuanian and English speakers. Per industry standard, working conditions in the plant were deplorable. What agitated workers into declaring a strike, though, was the imposition of a “bonus system,” whereby the piece rate per garment was cut and male supervisors were given more discretion over which workers did and didn’t get paid. An estimated 41,000 workers joined in once the strike was endorsed by the United Garment Workers (UGW), though Chicago organizers criticized the union for failing to call for a general, industry-wide strike. City residents rallied in support of striking workers, with doctors offering free medical care and theaters hosting benefit performances for the union’s strike fund. Chicago authorities were not as kind: City police and agents hired by the textile companies shot two striking workers dead, with three other Chicagoans killed as the result of stand-offs between workers and their employers. In the wake of the Great Depression, Los Angeles dressmakers began a strike that would spread to an estimated two thousand workers and eighty manufacturers. Textile employers routinely violated the city’s living wage ordinance, paying workers only for the time they spent cutting and sewing parcels of garments, which came in at odd intervals. Dressmakers worked on hot and poorly ventilated shop floors, and work was often irregular, with few guarantees of paid work on a given day.